Since 2000, IMA has worked alongside the Congolese government, donors and an array of local and international partners to revitalize the country’s health system, fight diseases and improve the health for a population in desperate need. Such long-term investment in the Democratic Republic of Congo has required resilience, creativity, and an incredible network of staff and partners to navigate successive armed conflicts, political instability, impassable roads and other obstacles that continue to threaten the health and well-being of the population. Committed to reducing morbidity and mortality in women and children under age 5 by strengthening the national health system in 52 health zones in the Democratic Republic of Congo, the Access to Primary Health Care Project, known locally as ASSP, had an exceptional year in many ways. Despite recent civil unrest and insecurity in central Congo that affected approximately 3.3 million Congolese—entire communities, health center staff, and partners—the achievements demonstrate a significant resiliency of the health care system that is being reinforced through the ASSP project. After seven years of leading the groundbreaking USAID Ushindi program in Eastern Congo, IMA World Health continues to work on a comprehensive program that focuses on reducing sexual and gender-based violence incidence and improving the quality of and access to holistic care for survivors. This initiative will help communities develop greater acceptance of positive gender roles, increase availability of gender based-violence services and change perceptions of stigma associated with reintegrated survivors. IMA is proud to be a part of the team that is changing the narrative and the trajectory of health care in the DRC. Powered by partnership, new technologies are solving stubborn problems, successes are scaling up into widespread solutions and—most importantly—our vision of health, healing, and well-being for all is becoming more of a reality in the DRC every day. With funding from the UK Aid’s Department for International Development, the Access to Primary Health Care Project, known locally as Accès aux Soins de Santé Primaires or ASSP, aims to strengthen priority interventions such as the treatment of malaria, pneumonia and diarrhea; nutrition; obstetric and neonatal care; family planning; immunization; and water, sanitation and hygiene that are delivered through the health system. These intervention packages aim to improve the health of the mother, newborn and child. ASSP supports an estimated 9 million people across 52 health zones in five provincial health divisions (Kasai, Kasai Central, Maniema, North Ubangi and Tshopo). Using an approach based on the World Health Organization’s six pillars of health systems strengthening, ASSP collaborates with the Ministry of Health (MOH) at all levels of service delivery, including the national and provincial levels and with focused support to health zone, health facility and community levels. IMA and its partners ensure that more than 75 percent of the project resources are concentrated within the health zones for service delivery, empowerment, accountability and capacity building of local community service organizations, partners and MOH representatives. ASSP provided 1.27 million pregnant women with two doses of intermittent preventive treatment in pregnancy. The USAID-IMA World Health Counter-Gender Based Violence Program (known locally in Swahili as “Tushinde Ujeuri”) establishes community-based safe houses and supports community groups in eastern DRC to prevent and respond to sexual and gender-based violence (SGBV) with the goal of reducing violence, resolving stigma and improving holistic care for survivors. Building on the highly successful USAID Ushindi program IMA managed from 2010-2017, Tushinde uses a holistic approach to meet survivors’ basic health needs, including urgent medical care and psychosocial counseling; legal support; and socioeconomic and livelihood activities such as village savings and loan associations, literacy circles, women’s empowerment groups and more to help survivors gain financial independence and social support. Together, these activities restore health, dignity, justice and opportunity to survivors and those affected by SGBV. In May 2018, the Ministry of Health requested that ASSP staff support Ebola data-visualization work as part of the response to the Ebola outbreak in western DRC. With funding from DFID, this work included supporting the setup of the electronic database—as part of the national DHIS2 system established in 2014 through ASSP—to capture patient and contact data, and to monitor and evaluate information as it became available through data dashboards. Through this work, DRC officials have been able track all recent outbreaks and make tactical decisions for response and containment. With funding from the USAID Office of U.S. Foreign Disaster Assistance, IMA is responding to the ongoing outbreak of Ebola in the Ituri and North Kivu provinces of northeastern DRC, where IMA also implements the USAID Tushinde project. Focused on a target population of 764,060 people, IMA provides community outreach and mobilization by training and sensitizing community outreach workers and the general public on signs and symptoms, disease awareness, means of prevention and reduction of stigma; contact tracing in association with the World Health Organization-supported contact team; provision or rehabilitation of water, sanitation, hygiene and waste management facilities and equipment in nine health facilities; and facilitating health facility-based infection prevention and control measures in 25 targeted at-risk facilities, with expansion planned in 25 additional facilities. With USAID/OFDA funding, IMA worked with SANRU to provide primary health care services free of charge to IDPs and other destabilized populations within the conflict-affected Kasai provinces in DRC, with an estimated target population of 1,689,561. Health care services were provided in 125 health centers. 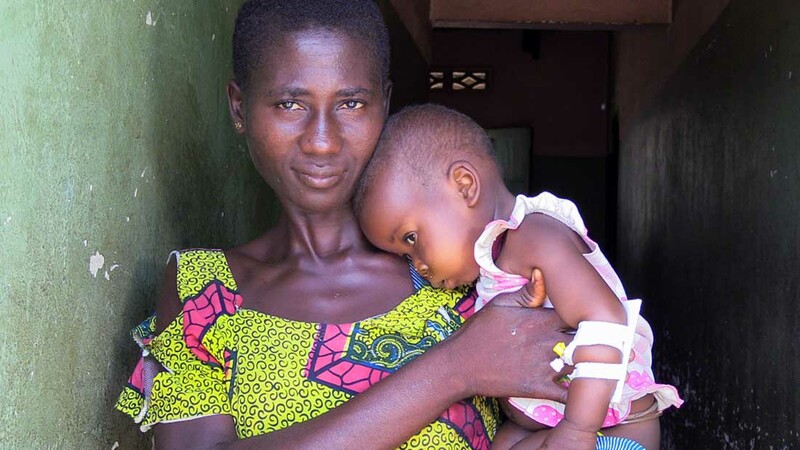 In total, 1,000,039 new patients received treatment, and despite insecurity, many health targets were met or exceeded thanks to the resilience and dedication of health workers IMA has supported through ongoing health systems strengthening programs. For example, the initial target was a service utilization rate of 75 percent, but cumulatively the utilization rate reached close to 100 percent due to high demand. The project also exceeded communicable disease targets, with diagnosis and treatment of diarrhea provided to more than 93,000 patients (target of 35,000), over 560,000 patients for malaria (target of 257,000), and more than 152,000 patients with acute respiratory infections (target of 20,537). All reproductive health targets were also met or exceeded. Pregnant women attending at least two antenatal visits, for example, totaled 40,108 (target of 39,030). With USAID/OFDA funding, this project addresses key challenges in health care and food security resulting from conflicts in Kasai and Kasai Central provinces of DRC. Its multi-pronged approach targets key areas for recovery and resilience, including food security, health care and related water, sanitation and hygiene improvements. Working with longtime local partner SANRU, IMA is working to restore the functionality of health facilities that were burned and/or looted, including replacing lost equipment and rehabilitating WASH infrastructure. The program will also seek to build financial sustainability in the health system and lessen undue burden on already vulnerable populations with a gradual transition back to user fees for health services, as well as support vulnerable households facing food insecurity by assisting families in food production and linkages to markets. 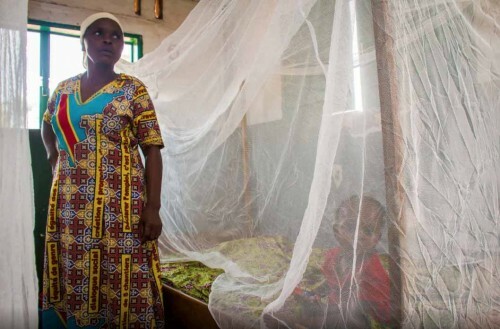 Under the new Global Fund financing model, and with management by long-time partner SANRU, IMA World Health implemented malaria interventions in 35 health zones in North Kivu (33 health zones) and South Kivu (two health zones) provinces from 2015-2018. Over 1 million long-lasting insecticide treated nets (LLINs) were distributed to pregnant women and children under one, and prenatal consultations and preschool medical screening for children were conducted. Out of the 5,663,676 patients suspected of malaria, 97 percent of cases were tested in health facilities and community care sites using Rapid Diagnostic Tests or Stained Blood Films. Global Fund expanded the scope of work for routine distribution in 2018 to include managing the distribution of tuberculosis and HIV/AIDS treatment and prevention supplies and equipment. IMA’s geographic coverage increased late in 2018 to include the province of North Ubangi. IMA teams in both provinces are engaged in rapid start up for routine distribution to address all three diseases. In addition to routine distribution, Global Fund supports province-wide mass distribution of LLINs. Working as a sub-recipient to partner SANRU, in 2019 IMA will manage mass distributions in five provinces: North and South Ubangi, Mongala, Tanganyika and Haut Lomami. While data for most mass distributions in the region are collected by paper forms, which is cumbersome and high risk for data quality issues, IMA has been using smartphones and open source software since 2015 as an innovative and transparent electronic data collection method. The ENVISION project, funded by the United States Agency for International Development and led by RTI International, aims to empower governments of endemic countries to lead NTD control programs and scale up the delivery of preventive chemotherapy for the seven most common NTDs. In the DRC, as an implementing partner, IMA supported the DRC NTD control program to conduct annual MDA of three medications, reaching more than 500,000 people in six zones in northern Maniema Province in 2015-2016 and in three zones in 2017, with the goal of treating 80 percent of the population for LF, onchocerciasis, schistosomiasis and STH. Transitioning with USAID’s updated strategy for DRC in 2018, IMA was tasked with conducting rapid assessments and mapping surveys to find the extent of trachoma in suspected regions of the country. To date, mapping has been completed in Ituri and Bas Ulele provinces, and rapid assessments have been completed in Equateur, Mbandaka, Tshopo and Maindombe provinces to determine if full mapping is needed. 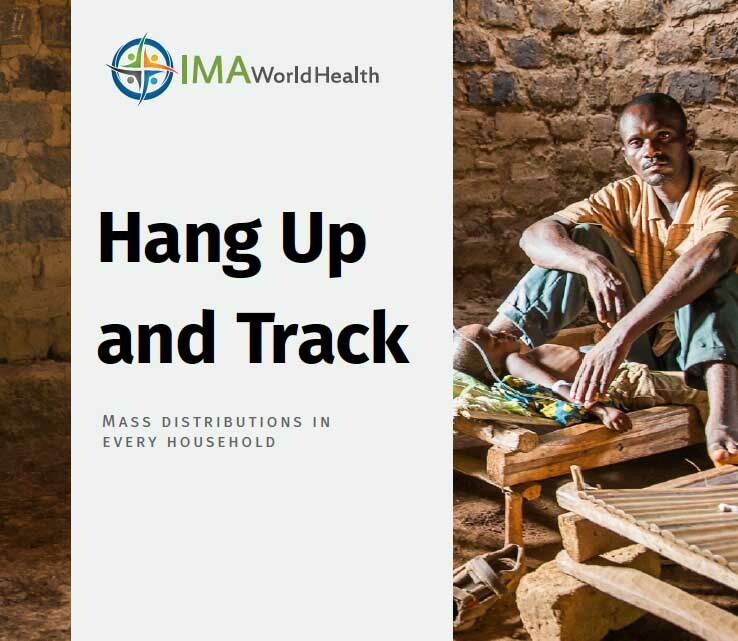 IMA is the first organization in the DRC to leverage mobile health technology for mass long-lasting insecticidal nets distribution campaigns. By using the ‘Hang Up and Track’ strategy, not only is each household pinpointed through GPS, but the entire distribution is aggregated visually.